Fall is finally here and it’s time start crafting! Pinecone crafts are a great fall crafting idea because it gets your kids outside to enjoy the last of the warm weather. Plus, pinecones are free! So all of these crafts are budget-friendly. Here are 15 of the cutest pinecone crafts for kids! With just a little ribbon, paint, glue, and a small tree branch, your kids can be fall forest royalty with this simple pinecone crown and wand. These flower magnets are a great way to display your children’s refrigerator artworks. You will have to help your kids with this one because it requires cutting the pinecones and using a hot glue gun.. This pinecone teddy bear is absolutely adorable. The instructions are in Dutch, but luckily there are some easy step-by-step pictures of the process. You simply glue a series of different sized pinecones together and voila an adorable teddy bear you can display on the fireplace mantle or a bookshelf in your child’s room. We are swooning over these adorable felt and pinecone elves. They’d make a great Christmas gift or tree decoration. This project is better for older kids because there is some sewing and a hot glue gun. For a creative fall centerpiece for your Thanksgiving table, consider making these beautiful pine cone roses. Simply paint the pinecones, attach them to sticks, and display in your favorite vase. This gorgeous pinecone mobile incorporates other found nature items like twigs, acorns, and physalis. Strong together, these make a wonderful seasonal decoration for any kid’s room, but beautiful enough you’ll want to hang it in your living room. Succulents are a huge home decor trend right now, but they can be a bit of a pain to take care of especially if you are busy with your kids. Instead of buying succulents, you can paint pinecones to look just like the real thing. Place in a frame for a vertical garden or just place in small flowerpots for a simple decor item. Not only can you make crafts out of pinecones, you can use pinecones to make crafts. You kids can make a gorgeous abstract painting by using a pinecone as a brush. This project can be a little messy though, so make sure you lay down a protective surface before you get started. 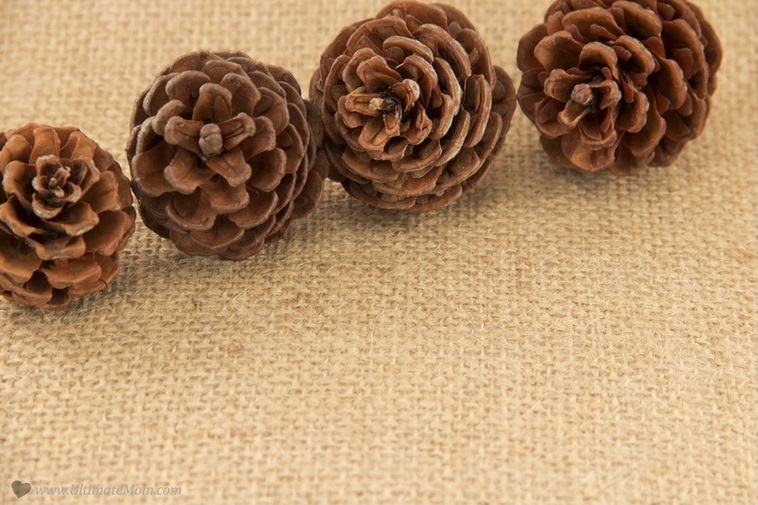 Pinecone garland can be easily incorporated into your home’s fall or winter decor. Simply string pinecones together on yarn and hang. For added style, you can paint the pinecones however you want before stringing them together. Nature Craft Wall Hangings is a fun craft for tweens. Stringing glass beads together with a pinecone at the end makes a funky wall art that would go great in any room. Make them as long or short as you’d like, the design is completely up to you! Scented pinecones are a fall home staple. This project uses scented paint made with simple household ingredients to make deliciously scented and beautifully decorate pinecones to keep your fall home looking and smelling great! When painted, the bottoms of pinecones look just like zinnia flowers. This craft may require a little help from you because you have to cut the pinecones in half. However, once cut, your kids can paint away. Display in a bowl or bunch together into a wreath for a great faux floral arrangement. This skiing pinecone snowman is a super fun craft you’ll want to make together. Display on a small mound of batting for a perfect winter scene, hang as an ornament from your tree, or make a couple for your kids to give as gifts to their friends. There are so many different kinds of animals you can make with pinecones. Using felt, paint pom poms, feathers, googly eyes, and construction paper you are only limited by your imagination. Pinecone bird feeders are probably the most classic pinecone craft of all time. Simply spread peanut butter on your pinecone, roll in birdseed, and hang on a tree outside. Make sure you place the bird feeder by your window, so you and your kids can watch for birds who come to eat.